It is widely accepted that promoting research education through initiatives and early exposure to research experiences boosts long-term student career profile and increases the culture of evidence-based medicine in clinical practice. Our Office of Research for Medical Students, led by Dimitra Bourboulia, PhD, helps students to identify intramural and extramural research opportunities including mentors, funding and programs available that would allow them to participate in research projects across all College of Medicine Departments and Centers or in off campus institutions. 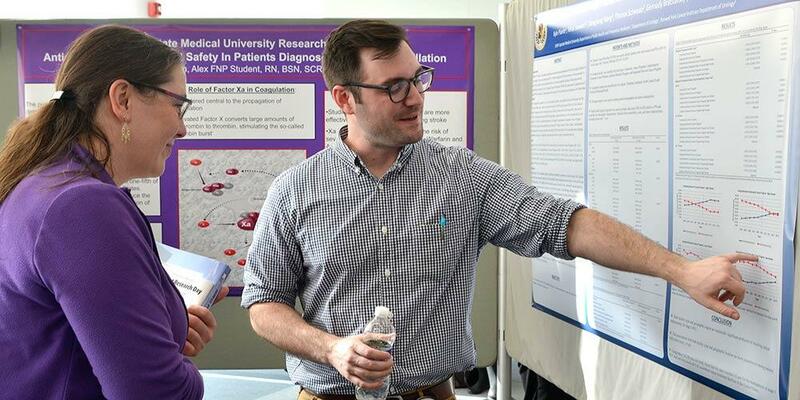 Here at Upstate Medical University, Medical Students work together with faculty members in cutting-edge research projects across more than 20 basic and clinical research departments. Hypothesis-driven research takes place in basic research laboratories and in clinical settings. Foster Innovative and Interdisciplinary research among Undergraduate Medical Students and Graduate Medical Trainees, through participation in Basic, Clinical and Translational research opportunities, summer programs and fellowships. Students interested in exploring research opportunities can visit web pages for Research Departments, Faculty Research Areas, and Major Research Areas to begin their exploration. Following that, students can contact the Office at Meds4Research@upstate.edu for assistance with specific programs. Last Modified: February 13, 2019. Contact Danielle Limer-Nies with questions about the content of this page.